EXTENDED TILL 31 DEC: Dangerously addictive delicacies, delivered. because it’s going to be easier than ever to get your hands on them. You may order up to 10 packs per order. Stocks are limited, but quantities refresh daily! So just try earlier the next day if stocks run out before you order. Are you ready to enter the danger zone? Q. Does GrabFood deliver to me? A. 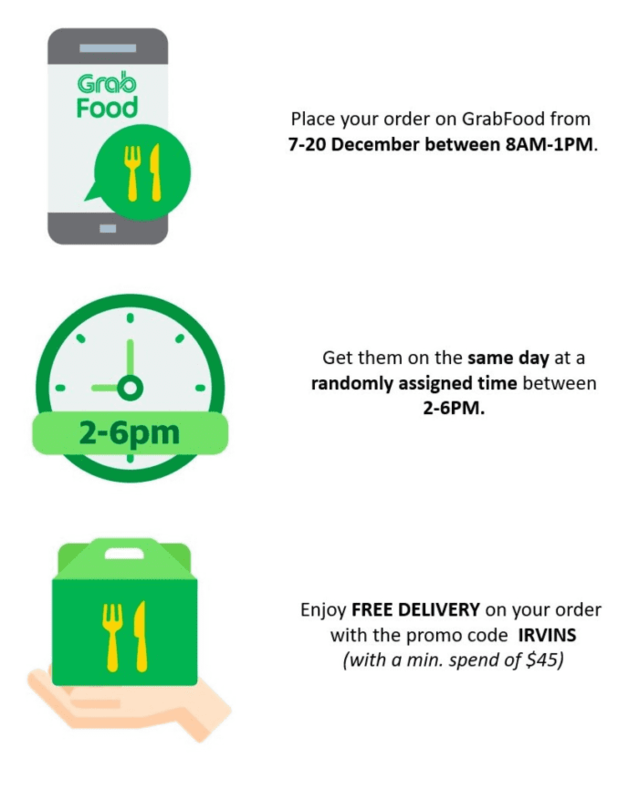 To find out if we deliver to you, simply launch the GrabFood app. If we deliver to your location, IRVINS will be listed from 8AM-1PM every day under “Featured Partners” until stocks run out! As a general guide, we currently deliver to the following areas, and those within the vicinity of these locations. Q. When can I place an order? A. IRVINS will be available from 10AM – 12PM daily or while stocks last, whichever is earlier. Keep an eye on your GrabFood app then! Please note that all deliveries will be done anytime between 2-6PM, regardless of time of order. Q. Why is the delivery fee higher than usual? A. GrabFood will be bringing IRVINS straight from its HQ, so there’s an extra distance covered for your delivery! Our delivery fees will go to our delivery-partners to compensate them for the longer trip. Q. Is there a promo code I can use? A. Yes, use the promo code IRVINS to enjoy free delivery with a minimum order of $45. Q. Can I order from IRVINS if I do not have a Grab app? A. You’ll need to have a an existing Grab account wIth a verified e-mail address in order to use GrabFood. Q. How do I get the email address I registered with, verified? A. You’ll need to request for a verification email! To find out how, please refer to this link for a step-by-step guide. Q. How do I top up my GrabPay wallet/purchase GrabPay credits? A. Topping up your GrabPay wallet or purchasing GrabPay Credits is super simple! Please refer to this link for a step-by-step guide! Q. What if I don’t have anyone to receive my order? Am I able to pick it up from the physical store? A. No, you will not be able to pick up your order from us. If you’re not at home, please have someone ready at your delivery address to collect it on your behalf. Q. Why is my order taking longer than expected? A. We seek your understanding and patience as we’re managing a large demand from fellow foodies! We will get your order to you as soon as possible. Q. The store is listed as closed and I am unable to place an order. Why is this happening? A. Please be advised that we have limited quantities available. Please try again on the other days! Q. I’ve forgotten to apply the promo code! What can I do? A. Unfortunately, this would mean you’ll have to pay for the delivery fee for this order. Nonetheless, feel free apply the IRVINS promo code* to enjoy free delivery for your next order. 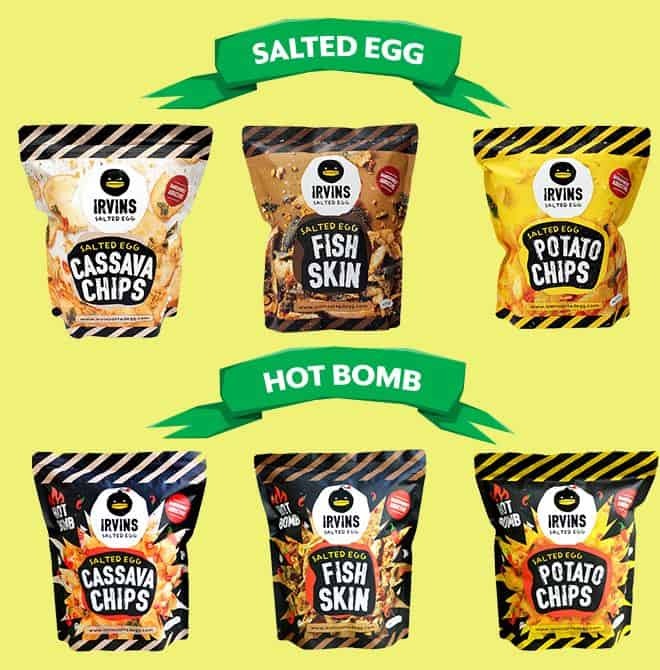 *IRVINS promo code entitles user to free delivery for orders of Irvins Salted Egg Snacks with a minimum order of $45 and is available from 7 to 31 December 2018, whilst stocks last. *IRVINS promo code has limited redemptions available. A successful redemption is only made upon checkout.